When most people think of Google, search comes to mind – and rightly so! Hundreds of millions of people have come to know and love Google.com as their starting point for searching the Internet. About 2 years ago, we introduced Google Desktop to extend Google search capabilities to your Mac and, earlier this year, we launched a developer preview of the next evolution of search outside the browser. Today, we're officially releasing this technology to all users as the Google Quick Search Box (or QSB for short). With Google Quick Search Box you can search for information from just about anywhere. As you type, suggestions will appear that match your query, ranging from applications and local files on your computer, to web search and navigational suggestions, to items from your browser history and contacts - and the types of results you can get will only grow over time! Check out the screenshot below for an example of the types of blended results you might see. Once you've found the result you want, we wanted you to be able to DO something with it. To find out what you can do, select a result and press the tab key or the right arrow on the keyboard. Some examples of actions include instant messaging friends, playing a song, or emailing a URL. Just like the data you can search over, the list of actions you can perform will grow over time! The quickest way to launch the Google Quick Search Box is by pushing Control + spacebar at the same time (Google Desktop devotees will still be able to press Command twice to summon the box). 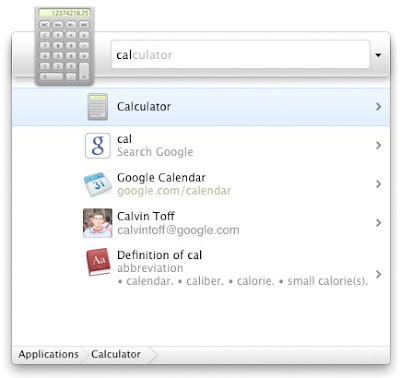 If you prefer another keyboard shortcut to summon the Google QSB, you can change it in the Preferences panel. As you use the Google Quick Search Box more, it will learn which results you are likely to want. The goal here is that we get you to what you're looking for as quickly as possible. In the above example, if you chose Google Calendar, the next time you search for "cal", Google QSB will reorder the results so that you don't have to arrow down to your desired choice. Instead, you can just type "cal" and press enter. Last, but definitely not least, the Google Quick Search Box is extensible. This means that anyone can create a plug-in that enables the QSB to search over additional data or perform more actions on results. As an example, we really enjoy the Twitter plug-in . After enabling that bad boy, we can send tweets right from the QSB and then do a Google search right after! The Google QSB has allowed us to do our daily tasks faster. If you want to give it a try to see it speed up your day, visit www.google.com/quicksearchbox/. If you're a Google Desktop user and you want to gain this functionality, you can learn more about Google QSB and see how to upgrade in this help center article.